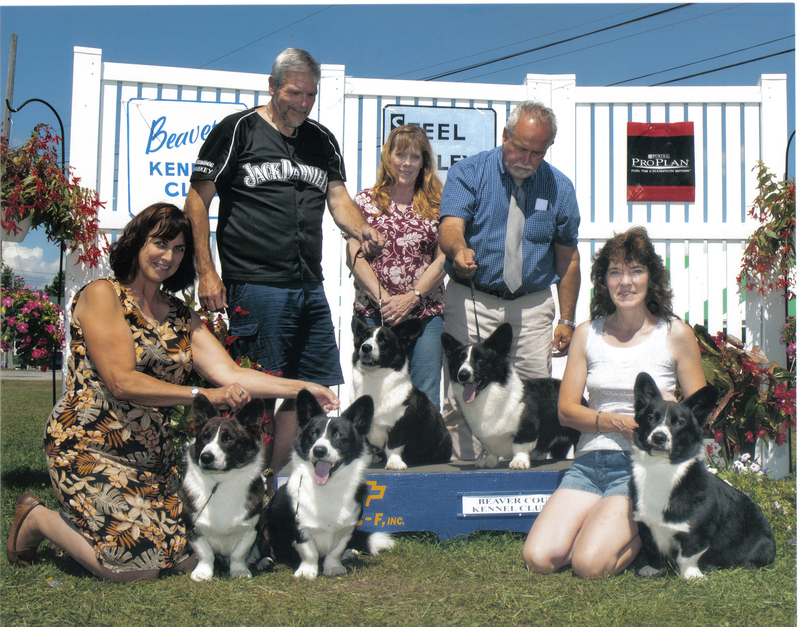 This photo was taken August 2013 at the Big Canfield Ohio AKC all-breed dog show. This shows Jolie and Boomer with their three Champion Boys Schooner, Mason and Cracker. All three finished before the age of 18 months and Cracker is already a Grand Champion. This was a proud moment for the Dragonpatch. We thank Kathi of Rocky Ridge Kennels for taking Boomer to heights we never thought possible and of course professional handler Tim Zietz for showing both Jolie and Boomer to top ten rankings. Now our future depends on the Holly Huff the owner of Mason and LuAnn Kennedy owner of Cracker to continue the winning ways of the Dragonpatch and to the keep tradition of ROCKING ON ALL FOURS alive and well. PreviousJake’s first herding experience. OMG is this cool!!!!!! NextPuppy fun, all the pups are spoken for now, watch for them in a show ring near you.